Zalmay Niazy and Senator Chuck Grassley. 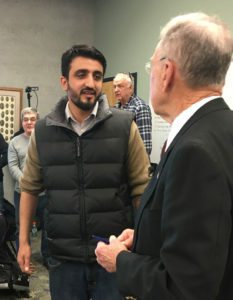 A man from Afghanistan who’s applied for political asylum in the U.S. went to Senator Grassley’s town hall meeting in Iowa Falls Tuesday to ask for help. Zalmay Niazy has been living in Iowa Falls and he got universal applause from the partisan crowd when he announced he had “proudly” served as an interpreter for the U.S. military. Niazy told Grassley he applied for political asylum two years and four months ago, but is still waiting for the paperwork to be processed. Niazy said his temporary work permits have expired and, at this point, he’d rather go back to Iraq and be killed than live in poverty here. Niazy then choked back tears as Grassley promised to review his application for political asylum. “I want to make very clear like I make clear to anybody that comes to my office and asks for help: I don’t know whether I can help, but I’m going to try to help you,” Grassley said. Grassley’s hour-long town hall meeting had been rowdy, with partisan sniping in the crowd, but this was the rare moment of unity. The entire crowd applauded.